Trees, especially as part of a regional or urban green ecosystem, help create a better quality of life. Urban forests act as green infrastructure that conserves natural ecosystems and sustains clean air and water. They reduce stormwater runoff, cool the urban heat island, reduce air pollution, and provide wildlife habitat. Communities can offset the ecological impact of land development by utilizing the urban forest's natural capacity to mitigate environmental impacts. Urban forests also provide social and health benefits for individuals, as well as economic benefits for communities. This report, prepared by the American Planning Association (APA) in collaboration with the International Society of Arboriculture (ISA) and American Forests (AF), and supported by the U.S. Forest Service, addresses the need for planners to adopt a green infrastructure approach and presents the technical means to incorporate trees into planning. Find out how communities can develop urban forestry programs to capture the social and environmental benefits of trees. Urban forestry professionals and advocates will learn how to interface with the urban planning process to maximize green infrastructure and reduce gray infrastructure costs. 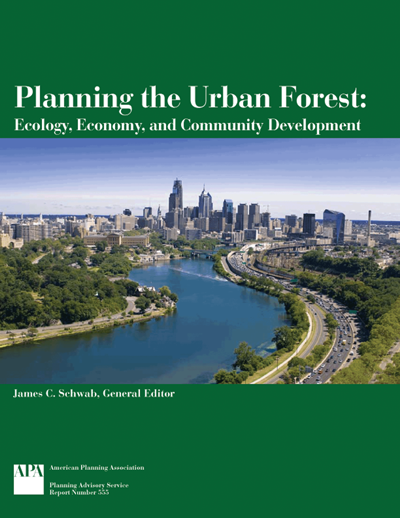 Thirteen case studies illustrate best practices in planning for urban and community forestry. Who is Involved in Urban Forestry?